Fear Free training for dogs fearful of vet visits or the application of treatments or medication. For dogs fearful of grooming or being touched. Taking care of our pets emotional, behavioural and health needs is ongoing 24/7 and a huge part of our responsibility as guardians for our companion dogs. 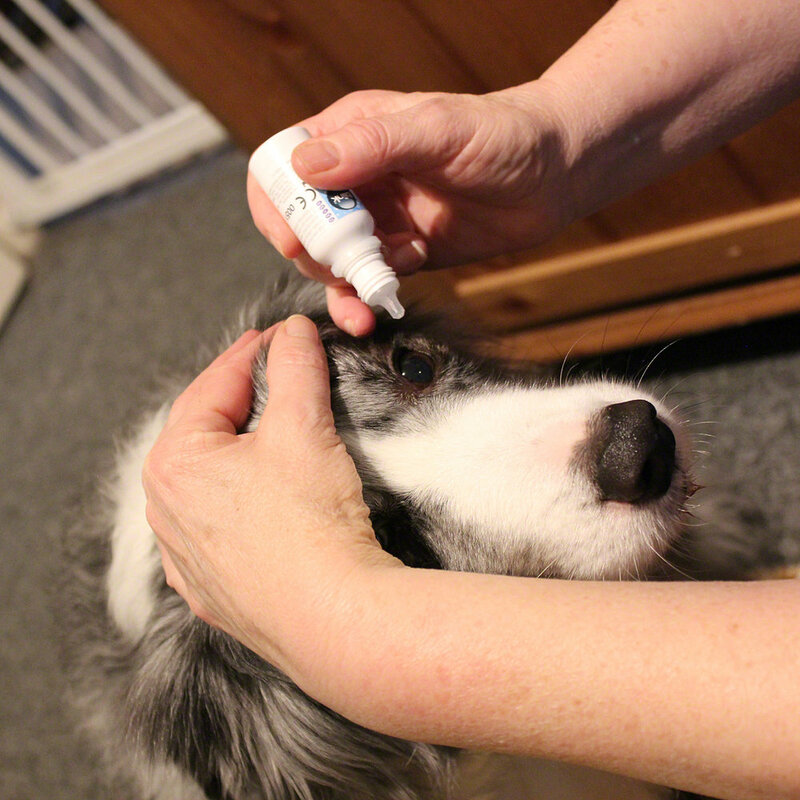 When our dog is ill and in need of a vet visit, medication or long-term treatment for a chronic condition, we can feel worried, defeated or just plain struggle to give our dog the prescribed medication, treatment or procedure they need. Fear Free training for emotional and behavioural health and well-being for our companion dogs. together care provides tailored training programmes to address your concerns and your dog's care needs. We work with you and if needs be your vet using fear free principles. From body shy to body confident. From top to toe and tail to teeth, we train care behaviours that are fun for you and your dog to learn. You may have seen documentaries featuring captive wild animals, perhaps where an orangutan offers his arm through a barrier or a lion presents his tail for a blood sample to be taken without the need for capture, restraint or anaesthetic. You have been looking at the power of positive reinforcement in action. The animals you may have seen have been trained to take part in their own healthcare, so procedures are positive experiences and not frightening, stressful or need forceful restraint. The principles of learning through Operant Conditioning are used to teach captive animals behaviours for care-giving, are increasingly part of care-giving in the companion animal domain. After all, if a lion can be positively trained to offer a “here I am, I’m fine with this” behaviour, why wouldn’t we be doing the same with our domesticated animal companions. Designed by leading veterinarians, The Fear Free Mission is to prevent and alleviate fear, stress and anxiety with care procedures and veterinary visits. As a Fear Free Certified Animal Trainer, I am able to offer a specialist service that supports owners with training that helps and empowers dogs to become participants in their care at home and at the veterinary surgery. together dog training works in partnership with owners and with veterinary teams to help our companions feel more relaxed and at ease with care giving. As with all our services, we tailor your together care training programme around your dog’s needs and your lifestyle. 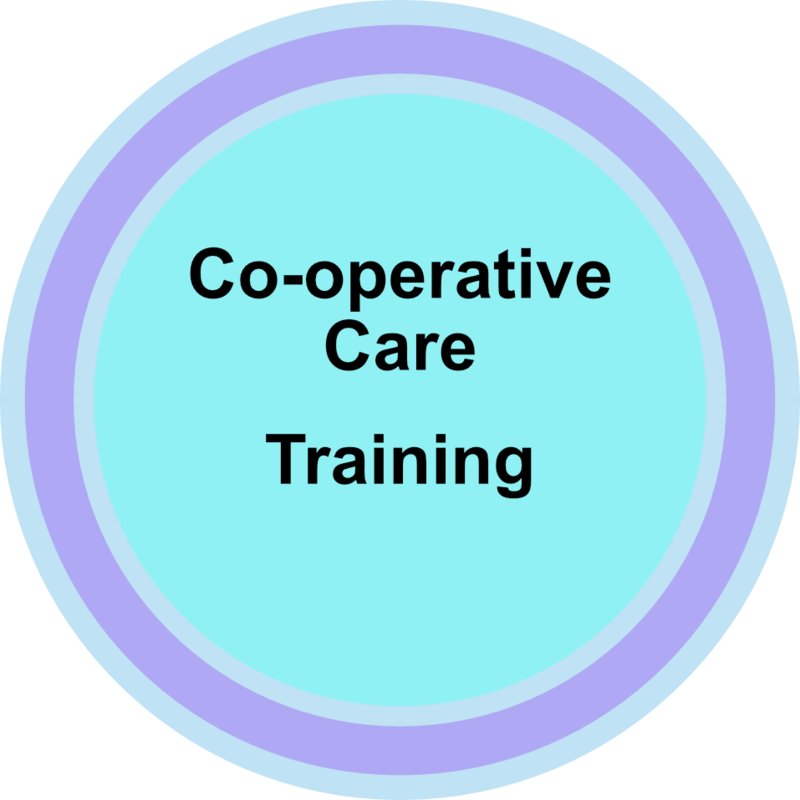 What does together care training look like? We tailor a training programme that best fits you and your dog’s needs. We train behaviours firstly at your home, then transfer these to your vet clinic if this is required. We can work in partnership with your vet surgery to make practise visits to help your dog become more familiar with the environment, procedures and equipment. Teaching a dog to approach a target such as your hand, a target stick or other object is the most useful way of moving a dog around without any hands on or force. 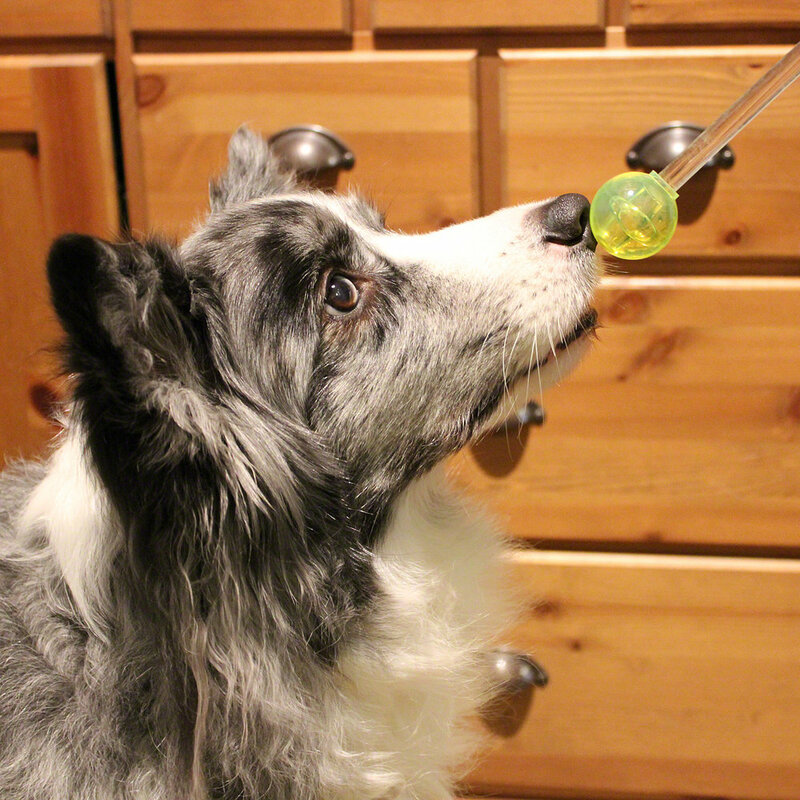 Once your dog is comfortable freely moving, we can utilise the target in lots of different ways. Watch this video to see how positive reinforcement (operant conditioning) is utilised by Jim Mackie, Animal Training and Behaviour Officer at London Zoo, to teach otters to step on a scale so their weight can be monitored. For owners of dogs that are fearful, anxious or stressed at or during veterinary visits, we take great care to structure an individual training plan for your dog using Desensitisation and Counter-Conditioning. Desensitisation and Counter-Conditioning have superb track records at changing emotional responses for humans and animals. Desensitisation is a learning process that initially enables the dog to experience the “scary” thing at a greatly reduced, non-threatening level of intensity, only moving to the next step when they are completely comfortable. Counter-conditioning means countering or changing how an animal feels about something, countering a negative emotion to a positive one. We start the plan only where your dog is comfortable right now, so for vet visits and for some dogs, this means we start in the carpark or even on the journey to your vet clinic. We spend up to two hours with you and your dog. We discuss the issues or problems you are encountering. We discuss the best way to resolve the difficulty you are encountering with your dog. We consider training options that are appropriate for your dog. We discuss why your dog is or has become fearful. We talk through what you can do right now to ease up the situation. We discuss how different training techniques work and how your dog learns. We discuss how training changes and modifies your dog’s emotional response and behaviour. We go through any help sheets or information which will help you and your dog. We work very closely in partnership with our clients and their dog to work through and to resolve your dog’s care difficulties. After your Assessment, we draft a Training Programme for your dog, write a full report detailing our discussions and provide background information that will help you understand your dog’s behaviour. Our Programmes come with free between Session support and guidance by phone or email and Homework that is appropriate for your schedule and your dog’s progress. I could go on for ever to say how well you have made Tilly into a civilised pet and me into a civilised owner, all at the same time. I was ready to give up on Tilly before you came to the rescue. I found out the hard way that I wouldn’t be able to brush Gigi’s teeth without her becoming afraid and running away from me. I learnt that training is a process like building a brick wall.